Breaking up with John in 1999 was a pivotal point in my life, of course I didn’t see it as such, it defined me and more than anything me face the person I was to become. The arguments had been there for years, the emotional drama’s the ‘cheating’ the lies and also love, and a deep concern. John had problems, haven’t we all, and amongst the memories I have is the first day we met, and the day parted and in-between listening to Geoffrey Howe resign, the holiday cottage in Wales (bad asthma attack included) miles away from anywhere on Halloween. I remember having to drive him to hospital even though I had not passed my driving test, I remember lots of things. I remember coming back from London, by surprise, to find my Flat turned into a Chinese Laundry as John was busily washing all my clothes and ironing them for my return, I remember the trip back from the Airport when I first flew back from New York. Over time I remember less of the hurt and the pain and more of the good times. I remember a blazing row when I stormed out of my own flat, slamming the door as I flounced down the street, I remember an argument in a pub that led him withdrawing into his shell when we got back, having to talk to him as I would a child – a broken hurt man, that somehow I was responsible for. I remember tearing the heart from his soul when I told I had met ‘someone else’. Within a week of meeting him I had handed him £1,700 because he had got behind on his mortgage, and the debts were rising, then it was £300 here, £600 there. Giving money to John was like giving drink to an alcoholic. I will say this for John that he worked damned hard to get out of the financial hole he was in taking on part-time work above his normal job. He would make an effort and then it would all be gone again, another crisis. Leaving John made me grow up, and for a long time I was still in love with him, in a sense I still am. I remember a couple of times when I was in Sheffield pushing notes underneath his door, but the stench of sadness seeped from his house, and that hurt. It hurt that someone I cared for was not enjoying life, it hurt because someone was hurting. I had consigned John to a passing reference, until recently when he got my address from the internet, from one of the photographs I had posted of a train. To cut a long story short he is dying, and his wish was to give me the money back he had borrowed. I have snippets from his life, his has found someone who he is married to, they went to New York for their honeymoon, I am really happy for him. The money he borrowed is welcome, I can foresee uses for it, mainly to put away ‘for a rainy day’ but still I feel sordid about it. I left for London in 1999 and to an extent I thought I had left John with the history books, and like Renton from Trainspotting I have seen that life changes, and that my life has changed. I am no longer the person I was, I have become someone new, someone that the person who headed to South London 14 years ago would hardly recognise, I am doing things now that would not have seen possible all those years ago, and yet this boy from Sheffield is sat here, wondering what I should do. Should I try and make some meaningful contact with him, accept the money and finally bolt the door on that part of my life. The former is what I want to do, though thankfully doesn’t seem to want to do (and I totally understand why) and yet the latter means my heart grows a little harder. John and I had been together for about seven years when we split up and I find it impossible, even if I wanted to, to eradicate those years. The emotional assault of the sudden contact has left me reeling, like a sudden blow to the chest. The next few weeks are going to be difficult for me, and my partner. Of course I have tell ‘H’ why I am suddenly vacant and distracted, why I need more space, and why I am become more ;tetchy. I wonder whilst I am doing this I can make him see that though this is hurting me, and probably him indirectly, it was a necessary part in the process of us coming together? During training on how to deal with people whoa are confused, either through drugs or alcohol misuse, I was trained to speak clearly and simply, no complicated sentences or instructions. Speak directly to the person, command focus be unambiguous. Europe is in a panic. We have a crisis of the financial system unprecedented scales, as one Euro Zone country fails and is rescued so another one teeters. The solutions are stark and often contradictory. There are a cacophony of solutions, yet it is the ‘Right’ that is providing the calm collected voice, the simple solution we crave. It is immigration that needs to be tackled, we need to leave the EU, we need to ‘Keep [insert national tag] jobs for [insert same nation-state]. The rise of right is directly related to our national insecurity to believe we can survive. We need answers that are simple even if they are unrealistic, we need a group, or groups, to blame for our predicament, we need answers – the simpler the better. In a very real sense the extreme right parties are the manifestation of our own insecurity and primeval fears that need to be comforted by knowing there is a solution, and we need not fear. The ‘Right’ panders to our need that we are not to blame for the crisis by overspending, a lack of investment, by not engendering co-operation between the workers and capital. Of course if we stopped immigration we have more jobs, but if you to look at the facts prescribing immigration actually harm our economy, we fail to attract the skills that we need to survive and prosper. Germany is benefiting form the current crisis by ‘importing’ relatively cheap Greek expertise in the computing fields, in fact certain sectors are booming. If we sent home foreign nationals from the labour force, could we fill the gaps we have created, I think we would struggle. What happens to our trade? Why would anyone want to trade with us when they could argue, using the same logic, that national goods and services should be used in preference to imported goods. Where do you stop? Sending home non-national Europeans (my partner is German so I have a vested interest, though would be really happy to move to Germany) would also mean their families, so presumably there would be a lot of people born in the UK that would be parentless, a drain on the Welfare State. Others countries could, legitimately, send their ‘foreigners’ back home to the UK. Of course sending Prince Phillip back to Greece might, how can we put this, be awkward. Thankfully the Queen is only a quarter German. If the arguments seem familiar, and I have not covered them in depth, then they are, I am looking at Germany, Spain, Italy, in to 1930’s and I am looking at Greece’s ‘Golden Dawn’, UKIP, and any other ‘right of right’ party that is emerging and gaining a foothold. Let us not forget that the 1930’s saw Moseley Black Shirts marching in London, and anyone who can say it will never happen here is forgetting their history. Drawing more lessons history it was voter apathy that allowed the National Socialist Party in Weimer Germany to control the country for ten years, ten years that blighted not only Germany but the rest of the world. We need strong leaders with equally strong democratic safeguards. Feeble Governments allow for dissension, confusion and ultimately the rise of the ‘right’. If the vote ‘splits’ between the established parties and UKIP in the UK then we will be playing a dangerous democratic game. Ever since Eastleigh buy-election on 28 February 2013 we have seen the Conservative and Labour Party swing to the right to shore up their support. The solutions offered by the ‘right’ are deceptively simple, they are deceptively simple because they do not address the cause, but only the symptom. The solutions to complex problems tend to be complex; I believe the solution to the EU crisis is not isolationism but deeper integration, that closer cooperation not segregation, that the answer is inclusion is the answer, not exclusion. 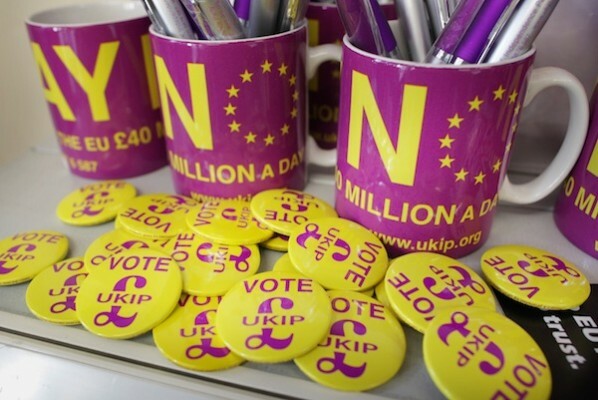 The policies of UKIP are not conviction politics they are opportunistic.